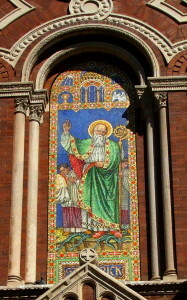 St. Patrick driving the snakes from Ireland. Wikimedia Commons, CC-BY-2.5; Released under the GNU Free Documentation License. Photo editing by the author. My latest article for A Sense Of Place on Patheos Pagan is up. Like my previous article on A Pagan Short History Of Valentine’s Day, it is a short analysis of a popular holiday in our culture. I find it interesting that these two posts have been by far the most popular of my writings at Patheos thus far. For me, the Elemental Ethos series I have been doing (Earth, Air, and Water thus far) have far more meaning to me, in that they are a reflection of how I try to live, and contain useful, real world applications of what I perceive to be a useful pagan ethos. Yet these haven’t been nearly as popular as my admittedly snarky deconstructions of the two popular holidays. Ah well. I have said all along that I will write what I feel for Patheos, without regard to aiming for a particular hit count or targeting my posts to a particular audience or reaction. It’s just interesting to observe. 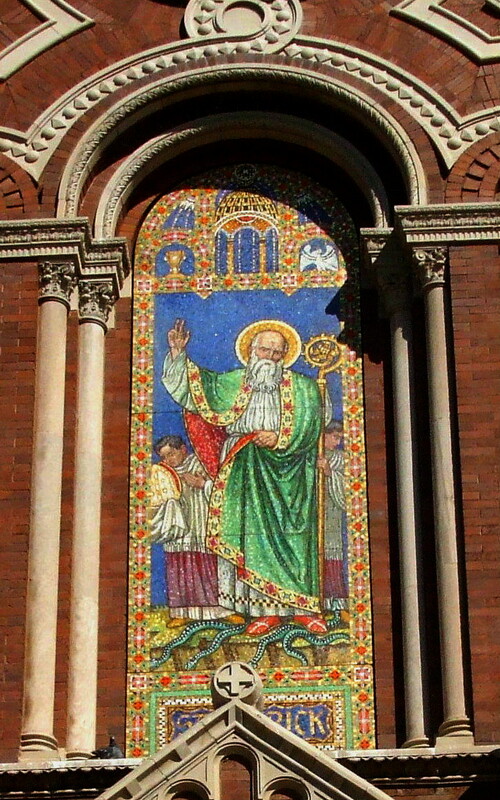 Some have commented that the notion of St. Patrick as The Great Oppressor Of Ireland Who Converted The Pagans/Druids With The Sword is historically inaccurate, and they are concerned that this myth just won’t seem to die. I agree completely, and I don’t want people to think this is my claim in this post. On the contrary, the meme is what it is, and it is not particularly accurate. I wanted to deconstruct the meme on its own merits, without regard to whether or not it is historically accurate. It self-deconstructs, in other words. My post just helped it along a bit; hopefully in due time it won’t have the widespread acceptance that it has today. Collecting the best water on the planet, as a gift of the ecosystem. 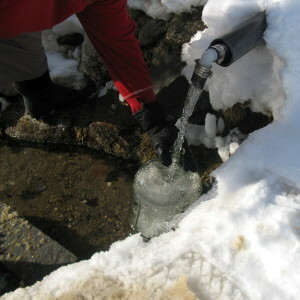 Despite the 3′ of snow on the ground, the water flows freely and is accessible. Photo by Morgan Lindenschmidt. My latest post, Elemental Ethos: Water, at A Sense Of Place over on Patheos Pagan is live. It’s no secret that water is probably my favorite element in terms of the practices I employ around them. Going to the spring is one of my favorite activities, it is probably the closest thing I have to going to church, or on a short pilgrimage to holy ground. There is lots of other exciting news a-brewing in my reality, but for now I will keep this under my vest. Yeah, I know, I’m a tease. OK, one hint for one item: my meadmaking practice has slowed down a fair amount in the past year, year-and-a-half. 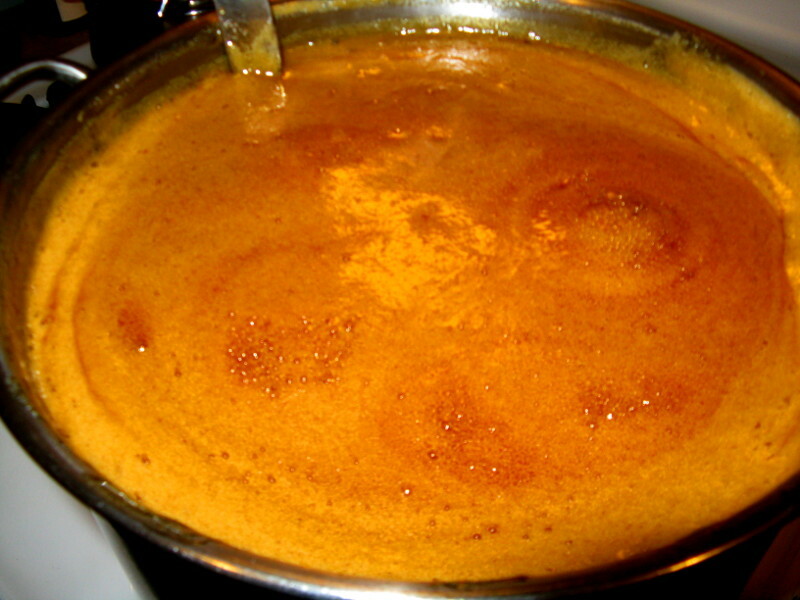 But tonight I’m going to make my first bochet, which is mead made after cooking the honey to caramelize it, which darkens it and brings out the rich caramel flavors. Carmelizing Honey for a batch of Bochet Mead. Details at BardicBrews.net. Turns out this batch was a bit of an ordeal, in the sense that it is very labor intensive. Also, it turns out that boiling honey splashing up onto the skin and sticking is painful. A gift for a gift. Details on Luna Bochet at BardicBrews.net. My next piece for A Sense Of Place on Patheos Pagan is up. I have gotten a kick out of the title for years: Pagan is Latin for Redneck. Since Paganus is the Latin term for “country-dweller,” this post contains an analysis of what it means to dwell, and how dwelling is central to my conception of paganism. As I’ve said many times, for me, paganism is more an ethos than a theology. So far, pretty much all of my writing on A Sense Of Place reflects this. My next piece will likely resume the Elemental Ethos series. Given this history of Valentine’s Day, I am a bit suspicious about it and don’t really participate in it. Of course, admitting so in public carries with it a stigma, the reaction is that I am not romantic or that I don’t love my wife or people in my community. On the contrary. I think that conflating a prescripted, commodified expression of romance with love is reductionist at the very least, and delusional at worst. Romantic bliss is not the only possible ontological state of a relationship, it is but one of many necessary for health and longevity of the relationship. Love is both a noun (something you feel) and a verb (something you do). It is co-created in relationship, and does not require dead trees, dead flowers, or chocolate. I’m still writing bi-weekly for A Sense Of Place. Look for my next entry there on the other side of this newest incoming snowstorm…. we are forecast to get another 1-2′ on top of the 3.5′ already on the ground.